Outdoor chemical storage buildings by US Chemical Storage provide a safe, compliant and effective solution for storing flammable and non-flammable chemicals. Flammable liquid storage sheds offer a customizable design specific to your storage requirements. Learn about the advantages of storing chemicals compliantly with US Chemical Storage. What type of material are you storing? 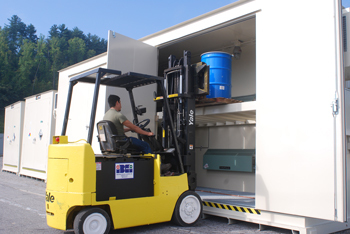 US Chemical Storage provides safe storage solutions for any type of chemical that you need to gain compliance for. Store flammables, combustibles, corrosives, poisons, fertilizers, pesticides, and chemical drums compliantly with a flammable liquid storage shed. Compliantly store flammables and combustibles with a flammable liquid storage shed by US Chemical Storage. All of our flammable liquid storage sheds are designed from heavy-gauge steel by professional engineers and experienced, certified welders. Offering superior protection and unmatched strength to keep your flammable liquids safe and secure. Store highly flammable liquids such as Class I, II, or III liquids compliantly. Our flammable liquid storage sheds can either be 2-hour fire-rated or 4-hour fire-rated, depending on your storage applications. Our 2-hour fire-rated FIREloc chemical storage buildings are designed for storing flammables 10 – 30 feet away from occupied facilities. This close proximity allows you to increase your operational efficiency, while staying 100% compliant. All FIREloc flammable storage buildings are 100% customizable to meet your exact specifications. Modify your flammable liquid storage shed with a wide variety of customizable accessories from US Chemical Storage. Meets EPA, OSHA, NFPA regulations and FM approval or Warnock Hersey standards. SUPERloc chemical storage buildings offer a bidirectional fire-rated construction for the ability to safely store your flammable liquids or other hazardous materials inside your occupied facility. The strongest and most dependable flammable liquid storage shed by US Chemical Storage. Features a built-in secondary containment sump for containing chemical spills, leaks or hazardous accidents. This flammable liquid storage shed is 100% customizable and 100% compliant. Customize your SUPERloc chemical storage building with explosion relief panels, alarm systems, liquid level sensors, explosion proof accessories, mechanical ventilation and more. Meets EPA, OSHA, NFPA regulations and FM approvals or Warnock Hersey standards. Contact US Chemical Storage to learn how to compliantly store your chemicals today.